Our continuum of senior healthcare and housing options includes assisted living, specialized memory care, and award-winning rehabilitation and skilled nursing care. All-inclusive care takes the guesswork out of monthly expenses. Use our comparison chart to inform your decision-making. What's it like to live at Linda Manor Assisted Living? With all-inclusive rates, your time is your own and you don’t need to worry if you need more care or a little extra TLC. 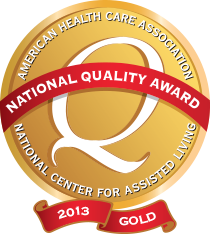 Recognized with a 2013 Gold – Excellence in Quality National Quality Award from the American Health Care Association/National Center for Assisted Living (AHCA/NCAL). Our family support group meets the third Thursday of every month at Linda Manor Assisted Living. Ask questions, learn tips, and find the support you need. 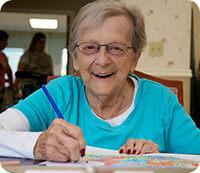 Linda Manor is proud to provide a continuum of senior healthcare and housing options on one campus, built on a tradition of caring and excellence. Families can be confident that loved ones receive attentive, caring support and have access to the right level of care when needed. 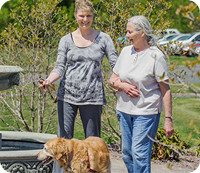 Linda Manor’s campus of care offers Northampton area residents all-inclusive assisted living with specialized memory care available for those living with memory impairment such as Alzheimer’s or dementia, as well as award-winning rehabilitation and skilled nursing for short-term rehabilitation and long-term skilled care. With Linda Manor’s range of housing and healthcare options, residents can rely on familiar faces within our communities when healthcare needs change or progress, and couples can remain close while each receiving the appropriate level of care. We are proud to be a trusted not-for-profit resource seniors and their families have relied on since 1989. Contact us to learn more about Linda Manor’s care options in Leeds, Massachusetts.